Michael Garlock has been the Operations Commander since 2015, supervising the patrol division, dispatch center, and the department’s records division. Some of his auxiliary assignments include: advising the department’s Explorer Post and managing the department’s Reserve Officer Program. Assisting Lieutenant Garlock with all these endeavors are the four patrol sergeants, Sergeant Gary Hopping, Sergeant Tucker Huey, Sergeant Bryan Morrison, Sergeant Jennifer Turner and the Communications Supervisor, Samantha Davis. Employed with the Auburn Police Department since 1995, Lieutenant Garlock’s time as a detective and a field training officer were some of his most rewarding assignments. 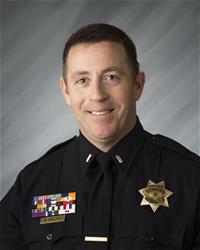 Prior to the Auburn Police Department, Lieutenant Garlock worked for the Yuba County Sheriff’s Department where he was assigned to the Jail Division. He also served in the US. Army Reserves from 1998-2005, and left service as a captain after commanding a Military Police Detachment in support of Operation Noble Eagle from 2004-2005. When he is not at work, Lieutenant Garlock enjoys watching movies, traveling to Yellowstone National Park, cooking, and wrangling his two dogs, Titan and Charlie. He is an avid baseball and football fan, and attends several Sacramento Rivercat games throughout their season.